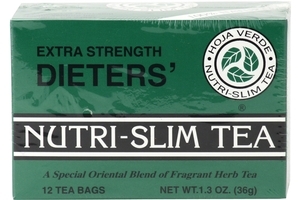 Hoja Verde Nutri-Slim Extra Strenght Dieters Tea in 1.3oz (36g) Box. Contain 3g x 12 tea bags/box. All Natural Special Oriental Blend of Fragrance Herb Tea. Nutri-Slim Dietary Supplement is for women & men. For those who like to stay slim and healthy, try this ultimate herbal tea twice daily for maximum result. Simply drink one cup of NUTRI-SLIM TEA twice a day 15 minutes after meals. Use one or two tea bags per cup. Larger quantities and darker color of the tea denotes greater relative strength. Use boiling hot water for maximum results. Steep for five minutes and stir well before serving. Then sit back and relax! Product of USA. 減肥茶, 瘦身茶. Stimulant method: Some of the diet teas have stimulants like kola nut, guarana, ephedra and ma huang, all of which act as appetite suppressants in the body and also aid in increasing the basal metabolic rate, or BMR. [6 units] Limit 6 per customer! Used for many many years , it alway's come's around for me.. Thank You Nutri-Slim. Really good for cleansing the body too Love it .